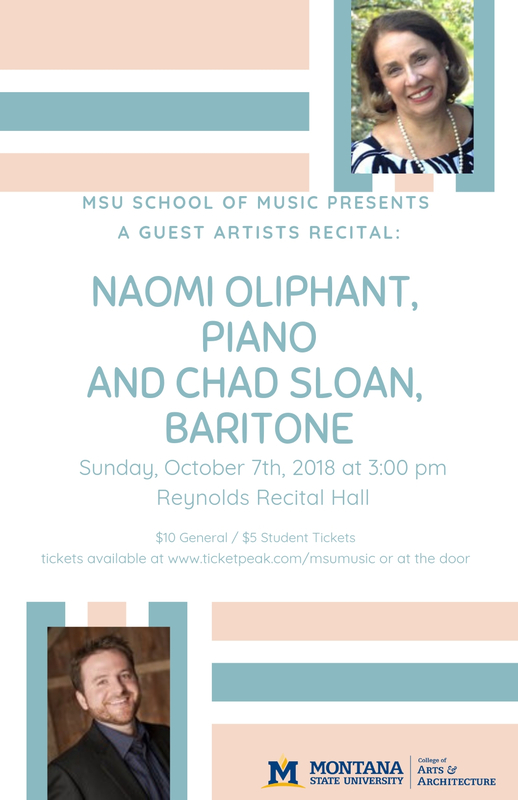 MSU School of Music is happy to host a guest artists recital of Naomi Oliphant, piano and Chad Sloan, baritone. 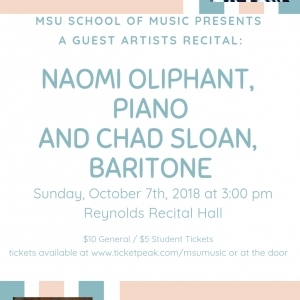 This event will be in Reynolds Recital Hall on Sunday, October 7th at 3:00 pm. Tickets are $10 for General Admission and $5 for Students. Tickets can be purchased at www.ticketpeak.com/msumusic or at the door. Naomi Oliphant has earned an international reputation as a soloist and chamber musician in the U.S.A., Canada, Europe, and Japan. Solo appearances include engagements with the Toronto Symphony Orchestra under Seiji Ozawa, the Louisville Orchestra, the Louisville Ballet, the Hamilton Philharmonic, and the Niagara Symphony. Her Carnegie Hall debut occurred in March 2010. Long-time pianist of The McHugh-Oliphant Duo, she performed well over 300 recitals, three European tours, and appearances on such illustrious series as The Phillips Collection in Washington and the Dame Myra Hess Memorial Concert Series in Chicago with violinist, Peter McHugh. Since 1999, she has given over 150 performances with tenor, Daniel Weeks throughout the United States, Canada, and on five European recital tours. Their CD, Women of Firsts, was released by Centaur Records label in 2009, and their newest CD, The Art Songs of Franz Liszt, is pending release. She is an inaugural member of the University of Louisville’s New Music Ensemble, The Grawemeyer Players. Coordinator of the Keyboard Area and Associate Dean since 1998, she received UofL’s 1994 Distinguished Teaching Award and the 2003 Distinguished Service Award from the Kentucky Music Teachers Association. She holds Mus. Bac. and Mus. M. degrees from the University of Toronto, a D.M.A. from the University of Michigan, and the Master Teacher Certificate from MTNA. An active lecturer, her articles have been published in major keyboard and pedagogical journals. American baritone Chad Sloan is recognized as much for his warm, elegant vocalism as he is for deft interpretations of diverse characters. In the 2012-2013, Chad performed Carmina Burana with Columbia Pro Cantare, Bach’s Weihnachts-Oratorium with Louisville Choral Arts Society, Brahms’ Liebeslieder Waltzer at Twickenham Music Festival, Britten’s War Requiem at Lawrence Conservatory and as baritone soloist in performances of Mozart, Beethoven and Bach with the Bach Festival Society of Winter Park. He also debuted with Opera Memphis in Lee Hoiby’sThis is the Rill Speaking. In the 2011-2012 season, Chad returned to the role of Prosdocimo, in Rossini’s Il Turco in Italia for Tacoma Opera, performed with the Lexington Philharmonic in Vaughan Williams’ Dona Nobis Pacem, Anchorage Opera as Captain Von Trapp inThe Sound of Music, and Mercutio in Roméo et Juliette for Dayton Opera and the Bar Harbor Music Festival. He was featured at Dallas Museum of Art in a multimedia concert based on the life and design portfolio of celebrated fashion designer Jean-Paul Gaultier. He also covered the title role of Willy Wonka in The Golden Ticket with Atlanta Opera and the role of Pluto in Telemann’s Orpheus for the New York City Opera. In the previous season, he returned to Kentucky Opera to debut his Belcore inL’elisir d’amore, to Utah Opera for John Brooke in Little Women, and debuted with the Bar Harbor Music Festival as Figaro in Il barbiere di Siviglia. He recently performed Telemaco in the critically acclaimed Wolf Trap Opera production of Il ritorno d’Ulisse in patria under the baton of Gary Wedow and was also featured as Harry or Larry in both the stage and film version of Elliott Carter’sWhat Next? at the Tanglewood Music Festival under maestro James Levine. Chad has also appeared as Raimbaud in Le Comte Ory for Tacoma Opera, Second Mate in Billy Budd for Santa Fe Opera where he covered Schaunard in La bohéme, and Masetto in Don Giovanni for Utah Opera, where he also covered Dandini in La cenerentola. He has previously sung the title role in Gianni Schicchi, Zaretsky inEugene Onegin, Claudio in Béatrice et Bénédict, and Le Fauteuil in L’enfant et les Sortileges. England under the tutelage of Roger Vignoles and Philip Langridge. On the concert platform, Chad was heard in Vaughan-Williams’ Fantasia on Christmas Carols with the Lebanon Symphony Orchestra, as well as Schumann’s Requiem für Mignon and Faure’s Requiem with the Louisville Choral Arts Society. Under the baton of Keith Lockhart, he performed Peer Gynt with the Utah Symphony where he was also heard in performances of Handel’s Messiah.